A story about how a lot of womenfolk fished an important baby in a basket out of the river Nile. CONTEXT FOR THIS LITTLE STORY. The story of Moses begins in the book of Exodus. But before we get to baby Moses, we learn in Exodus 1 that there's a new king in town (Egypt) "who did not know Joseph" (NRSV). In other words, gone are the good old days when a son of Israel looked out for the relatives. The text here says the king "set taskmasters over [the Israelite people] to oppress them with forced labour." The Hebrew midwives manage to wiggle out of an order to kill all boy babies born to Hebrew women. Since that didn't work, the Pharaoh got the whole country of Egypt onside with the plan of tossing all Hebrew boy babies into the Nile river. Into this dark picture comes Moses. MAP OF ANCIENT EGYPT & ENVIRONS. To see the area we're talking about in this story, click here. LOTS OF STRONG FEMALE LEADS. Canadian writer and former moderator of the United Church of Canada, Lois Wilson, dedicates a chapter to the women in Moses's life in her book Miriam, Mary & Me. "Pharaoh thought that Hebrew baby boys and men would be his undoing," she writes. "But it was the women! "The well-known story of the Hebrews' struggle for deliverance from Egypt is told through selected stories...of the courageous and subtle disobedience of the midwives Puah and Shiphrah, the resourcefulness of Moses's mother Jochabed; the quick thinking sister Miriam; the compassionate Egyptian Princess..."
"A cursory look at the contemporary ecumenical world-wide scene reveals an awareness of the Exodus as God's "No" to exploitation." WHAT'S THE BIG DEAL ABOUT THE EXODUS? "it is best to read Exodus as a finished narrative, a story — though never forgetting that it has a pre-history, and that in its final form within the larger story of the Torah or Pentateuch, it is the definitive story of the establishment of Israel as a people freed from human tyranny who become slaves to their own loving God." The birth of Moses is the first step in the first phase of the Exodus — 'liberating Israel from slavery by defeating Pharaoh' (paraphrase, NOAB). THE EXODUS STORY IS REALLY IMPORTANT! Canadian writer and scholar Northrop Frye also helps us get our bearings on the book of Exodus. The following two quotations are from Frye's book (with Jaye Macpherson), Biblical and Classical Myths (Toronto: U of T Press, 2004). The first is from Chapter 9: "The Double Mirror: Exodus and the Gospel:"
"The deliverance, consequently, is the one thing that happens [in the Old Testament]. As the Exodus is the model for every deliverance in the Old Testament, we can say that, metaphorically, the Exodus is the only thing that really happens in the Old Testament. Hence, in the Christian Bible, the Exodus would be, more than any other event in the Old Testament, the type [meaning something like prototype] of the most important antitype in Christianity, that is the Resurrection of Christ." This second quotation is from the same Frye book, Chapter 14, "Genesis: Creating the Sexes; Exodus: A Revolutionary Heritage." Now if you begin the story there, you have immediately wiped out the whole dreary chess game that is known traditionally as theodicy. That is, how are you going to reconcile the existence of a perfectly good God with a horribly bad world, and yet without involving the good God in the bad world in any causal way? ...The scene that begins the Exodus is much more intelligible. Here, there is a situation of tyranny and exploitation going on to start with: the first datum is injustice, tyranny and exploitation. God then announces that he is giving himself a name and a highly partisan role, and is going to enter history on the side of the oppressed classes. Never mind how you got into this situation: how you get out of it is the important thing." That's how important the Exodus is. No Moses, no Exodus, no Resurrection! The names of many characters here come from interesting root words. Moses. Pharaoh's daughter names the child Moses at verse 10 "because I drew him out of the water." Footnotes here in the NOAB note "Moses will live up to his name by drawing the Hebrews out of the Red Sea." Miriam. Lois Wilson points out that the name comes from the root word for "rebel." Puah (midwife). Means 'splendor,' (Wilson, MMM). Shiphrah (midwife). Means 'beauty,' (Wilson, MMM). **Wilson notes "the Bible identifies them as Hebrew women. Yet the have Egyptian names (p. 184.)" Wilson writes this "story underlines the necessity of demonstrating God's grace and generosity to one who is not only an enemy, but also of a different race, culture and religion." ANY SPECIAL SIGNIFICANCE TO THAT RUSH BASKET? Footnotes here again point out that the word 'basket' as used here "occurs elsewhere only concerning Noah's ark. As Noah's ark rescued humankind, Moses' 'ark' will rescue the future liberator of Israel. Since Moses will bring a new beginning, parallels with creation and flood are especially fitting." The more colourful phrasing of the King James Bible, seen on the Overview page in this lesson set, highlights the unsavoury and urgent nature of the rush basket operation and accentuates similarities between the Noah and Jonah stories and this one. OVERT PARALLELS TO THE CHRIST CHILD. In the image of a baby in a rather rough-hewn cradle against a backdrop of similar slaughters of the innocents, it's hard not to see the connections being drawn between this story and the Nativity. OTHER LINKS TO THE CHRISTIAN STORY. To examine the shared symbolism between these two stories, let's turn to Canadian writer and scholar, Northrop Frye. In his book The Great Code, Frye says of the Exodus it's part of the larger integrated story cycle of the Bible and "our first step is to realize that all the high points and all the low points [the narrative ups and downs of all Biblical characters] are metaphorically related to one another. That is, the garden of Eden, the Promised Land, Jerusalem, and Mount Zion are interchangeable synonyms for the home of the soul, and in Christian imagery they are all identical, in their "spiritual" form... with the kingdom of God. Similarly, Egypt, Babylon and Rome are all spiritually the same place... And the deliverers of Israel — Abraham, Moses and Joshua, the judges, David and Solomon — are all prototypes of the Messiah or final deliverer." The Israelites were not black, and nineteenth-century American blacks had no quarrel with ancient Egypt. The point is that when any group of people feels as strongly about anything as slaves feel about slavery, history as such is dust and ashes: only myth, with its suggestion of an action that can contain the destinies of those who are contemplating it, can provide any hope or support at all... myth redeems history: assigns it to its real place in the human panorama." A quick glance through the section on spirituals in the songbook 'Rise Up Singing' can suggest great arrangements of some of these classic numbers. How about 'Didn't my Lord deliver Daniel,' as performed by Canada's Nathaniel Dett Chorale. Look up the Golden Gate Quartet for definitive versions of 'Joshua fit the Battle of Jericho' or 'Swing Low Sweet Chariot.' Ralph Stanley has a haunting version of 'Twelve Gates to the City' on his self-titled album of a few years ago. Count on Roger McGuinn to provide us with some nice folk renderings of some of these pieces on the web. McGuinn's Folkden can be found at www.reveries.com/folkden. Scroll down to find the Archives on the right hand side. Click on the titles for 'Ezekiel saw a wheel,' '12 Gates to the city' and 'When the saints go marching in,' to name a few. 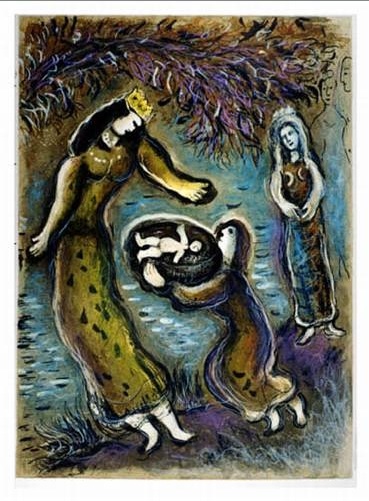 See on the same page Ratner's sculpture of the Pharaoh's daughter pulling baby Moses out of the water. Here's a painting by Hogarth of toddler Moses being returned to the palace. 1. Have you ever been in a situation where you felt trapped and belittled and you couldn't get out? 2. Can you describe that? 3.	Who did you reach out to for help? 4. In what ways did you reach out for help? 5. Do you think there was any risk involved for the people who were able to reach out and help you? 6. What thoughts or ideas gave you comfort or courage before you could get out of this situation? 7. Have you ever been called upon by someone else to help them out of a desperate situation? 8. Name some of the strong women characters responsible for saving the life of baby Moses? 9. What other story about a baby does the story of Moses remind you of? 10. What are the common elements between these stories? Arts -- Wikki Stix model of baby in basket. Egads, I've finally found it! The guaranteed easiest way to make basket. Wikki Stix. These seem basically to be length of wick coated in coloured wax that are bendable. So they adhere without glue. Available at the toy store where I work! Give each child six or so wikki stix. Cut these in half. Press into into a spiral to about 3 diam. Pull this up and out into a bowl shap. Press on a handle. Use remaining sticks to make a baby. Tuck baby in with tissue or cloth square if you wish. Why. To reinforce the idea of Moses's basket, and that he was drawn from the water (melon!). You can either do this as a group project on 1 large watermelon. Or pick up those ultra small weightwatchers watermelons. Cut in half and give each child half to make individual bowls. Using a child's pumpkin carving knife, cut a sawtooth edge around border of boat. Scoop out inside flesh. Cut pieces into cubes. Or use a melon baller for more fun. You can also further refine the chunks by using cookie cutters on them. Top up with other fruit, like berries, grapes, apple pieces, for fruit salad effect in your basket. See if you can create a 'baby' from fruit pieces and toothpicks. 4. Beloved of God (mime holding or hugging a baby). In iMovie (or other simple movie maker program), create a movie composed of a key scene from the Moses story. Find script here. Find here a little one act play drafted to go with a movie that may be produced in the computer lab above. The idea here is that Miriam is videotaping for her mom what happens to Moses after he's left alone in the water. To find the script, click here. Computer -- slide show of digital pictures.